After much thought and my succumbing to my usual weaknesses, I've decided to buy myself another vehicle soon-ish. 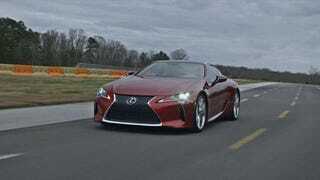 Unfortunately, it will not be this LC 500. I kind of have an idea of what it will be... I’m down to about eight real candidates. The odds that it’s another Toyota product is, uhhhhh, quite high, but I likes what I likes. I had long, meandering post about a camping rig, or truck, but what about the longbed, what about the IS, blah blah, what do I do... I have since reached point of clarity and focus. That said, it will likely require a sacrifice within the existing fleet... I’m not at the point in my life where I can justify having five cars again. With the house situation (endless project! <3 ), among other life thingies, I can tell you that my only justification for this is: because I wanna! My wife is supportive, so the only hurdles now are finding one worth buying and gathering monies. When I told her my budget, she replied: “You should spend [double] and get something really nice.” What a lady! I’ll be building my funds for it over the next 6-12 months. I’m excited. And I’ll be sure not to assault you folks with my usual, “TLDR, didn’t buy the car” posts.